On this page you will find information for schools either registered with School Angel or those thinking about joining us. If you are looking for what other schools who have used the charities services have said then you can have a look at our testimonials page. You can download the sample contract between the charity and any school which joins us, there are also sample email / letter templates to use to tell your parents, carers & school friends about the charity along with promotional ideas to really get your school charity page off to a flying start. There are also lots of facts & figures explaining just how big affiliate marketing is in the UK, and what your school can realistically expect to achieve if it joins our charity. Why should your School join School Angel? Affiliate Marketing - what is it? Affiliate marketing in the UK is very big business. Although you maybe not aware of it, when you make a purchase online another website will often be making a 'commission' from your purchase simply for directing you onto the retailers website. This is most commonly via a 'comparison' or 'review' website, think of Moneysupermarket, Uswitch or moneysavingexpert as examples, all of these websites make many millions of pounds every year using affiliate marketing. Affiliate marketing works by the process of dropping an invisible 'cookie' (tiny piece of computer code) when you visit the first website onto your computer. When you then go on to make the purchase on the retail website, they reward the cookie with a 'finders fee' commission for sending the sale to them. ​Cookies work on a 'last one in is the winner' principle. This is important because if you use School Angel and want to ensure the donation gets to your school you need to always click from your page before you make the purchase. That will mean you need to close down the review or comparison website and then open up your fundraising page for the final click into your shop. The UK online shopping spend is growing year on year. In 2017 we spent over £200 billion through on-line transactions with nearly 4 £billion spent on the black Friday weekend alone. This is set to increase by 10% year on year. This upward trend is set to continue, and on-line shopping is expected to increase well into the foreseeable future. Our choice of device for accessing the internet is steadily changing onto mobile although currently 66% of access is via computer and 33% mobile device. what could it mean for your school in actual numbers? As a ballpark figure we assume that behind every child in a school there are approximately four adults (parents, grandparents, uncles, aunties, friends). As a general rule of thumb you can assume that 5% of your adult base could be engaged in supporting the school. Okay so lets take a typical Primary of say 300 pupils. So that's £600 raised for very little effort and we would anticipate that a well motivated school could engage a higher adult base, so this figure is not over optimistic. School Angel is perfectly positioned to help your school raise significant additional funds to help your pupils. Our site is optimised across all devices and internet platforms. As a charity we are often able to negotiate enhanced affiliate contracts with businesses who benefit from association with a worthwhile charity. On top of this we work very efficiently, keeping our running costs low and returning the absolute maximum monies back to schools. We are not suggesting we will replace the efforts of all your school supporters who run the traditional car boot sales, coffee mornings, sponsored events etc, but we can help your school take it's fundraising into the 21st century with only the minimum amount of effort from the school and a very user friendly, easy way for your parents to help. There really is 'no catch' for schools. We don't make a profit, we don't capture any data from your parents so we never bother them with annoying junk mail or anything else! We are fully regulated by the charities commission so we have to be fully accountable, ethical and transparent in everything we do. how do we measure up to other organisations which also help schools to fundraise? Many schools already work with other fundraising organisations, so what's the difference with School Angel? Probably the most important single difference is that on average we generate at least three times more funds than any other fundraising website in the UK. what does the school have to do? Very little! Just have a look at the school contract (you can download it at the bottom of this page), it is written in plain English and very straightforward. Make sure you agree with the charities charitable aims (again available as a separate download at the bottom of this page). Our charitable aims govern what any monies generated can be used for. They are very broad, and we feel should enable any school to really positively help their children in a straightforward manner. Please understand that in accordance with charity commission guidelines, all profits from monies raised through School Angel remain the property of the charity and not the school, but are allocated 100% to your schools charity pot. The school can use the fund for any items or services which meet the charities charitable aims. Once you feel happy just contact us via our web form and we will arrange your school sign up. Once signed up you will need to promote the charity to your parents & carers by email or letter at least 6 times per school year (once every half term). You will also need to provide a permanent web link from your school website home page into the School Angel website. That's the minimum. Obviously to really engage your parents & carers, the more promotion you do the more they will use School Angel, and the more funds your school will raise. Remember you must be an active fundraiser with the charity otherwise we recycle your fundraising page for another school keen to join. Free technical help for your school website. Uedit are the web design company who have provided our School Angel website for free, and they maintain it. They specialise in building high quality websites for small businesses and school websites which you can easily update yourself and they have agreed to provide free help and advice to any school joining the charity on how to add in your website link if you need it. Can PTA's / School Supporter organisations join School Angel? We welcome PTA's or 'Friend Associations' but you must make sure that you have the permission of the Head Teacher for your school to register. You will need to be able to have a website button from the school website into your fundraising page as well. How can school's drawdown THEIR funds? Just visit our 'Drawdown Funds' page and submit the online form. Being a member of School Angel entitles schools to a very efficient method of fundraising and our extensive grant programme for disadvantaged pupils. A big part of what the charity does is to help disadvantaged pupils whist at school. These may be children who are disadvantaged through having a physical or mental disability or through social deprivation, often caused by poverty. Every year we award numerous grants to our schools to help individual children, applying for a grant is simple and straightforward and we fund over 90% of all requests. If you want to read more about our grant scheme then please visit our dedicated grant page. ​ from a charity cash-back competitor. This is the most important thing you must do after joining School Angel. Remember that the charity will never promote your school page to parents, we leave this important task up to the discretion of individual schools. But it is vital to understand that your page will not raise any money if your supporters do not find it, and then use it. Affiliate marketing is a very powerful way to raise funds but it only works if you give people a compelling reason to use your page, (hopefully this is the good they do by helping your school children) and then you must make the whole process simple, straightforward, trustworthy and clear. The School Angel website has been designed to be a straightforward and simple site for your supporters to use. The site requires no logins, no passwords, email addresses or names. We don't allow distracting advertising, flashing banners or annoying pop-ups. 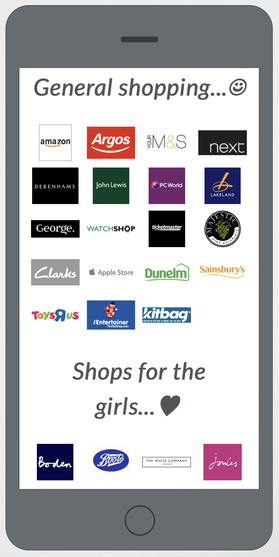 Each retailer is clearly identified just with their official logo and when you click on the shop you want to visit you go straight to it, not onto a redirection page like many sites use. It is unique in its simplicity compared with other fundraising websites and therefore should appeal to your parents and other school supporters, they can literally click onto your school page and click out in a couple of seconds into their chosen shop. You can be confident in reassuring your supporters that we never capture any personal information whatsoever, we simply do not need to because we are not a business, so have no interest in profiteering in anyway. It is vital that your supporters can easily find your fundraising page. You must insert a website button from your school website into your school's fundraising page on School Angel. Ideally this should be in a prominent position on your home/welcome page. If you place the link in either the website's header or footer section then you ensure it is available on every page of your site for maximum effect. You will find a selection of suitable School Angel logo's along with instructions on how to create your link in the section below. Once you have joined the charity we will email your bespoke link to use on your website. Please take every opportunity to promote your page to parents, the simplest, cheapest and most effective way is via your school email system, because you can provide a link from your email straight onto your school shopping page. Your parents have to open the email while on-line and over 80% will click on the link to your charity page there and then, instantly reinforcing your message. Once they discover how simple the system is to use you will build up your base of shoppers. Ideally encourage them to save your page into their 'favourites / bookmarks' so they can easily return again when they want to shop. We can now offer schools free stickers for placing on the staff computers as a reminder to shop through your charity page. They are high quality, printed on matt paper with a silver logo and text. They measure just 38mm x 21mm and have rounded edges. They are discreet without detracting from the style of modern desktops, tablets and laptops. Please get in touch if you would like the free stickers for your staff, or if you want to discuss giving them out to your supporters. You will need to send us a SAE for your stickers to be returned in. Online safety and personal security is something everyone who uses the internet should take seriously. School Angel is principally an online charity so we are always trying to think of useful ways to promote the charity and help you stay safe. Recently there have been numerous reports of cyber- criminals remotely activating cameras on devices so they can make recordings of you while you are online etc. ​ A really simple way to combat this is to fit a plastic webcam cover slide which enables you to use your camera when you want it but block it when you don't. 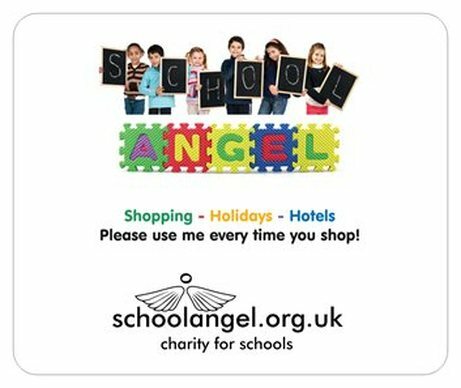 These can be branded as shown here and then become a clever reminder for your supporters to remember school angel when doing their online shopping. ​These are not cheap so we would need a significant order to make them cost effective and they would probably work out at about £1 per cover. This is a great bookmark for Primary Schools, it is practical, effective and cheap. It is printed on quality card, laminated on both sides and works out at 7.0p per unit. Fridge magnets - children love them and therefore they tend to be kept, and looked at many times a day! Available for 5.0p each. Mouse mats - a really powerful promotional tool, sit right next to you when you are online! School Angel now only uses Twitter for social media communication. 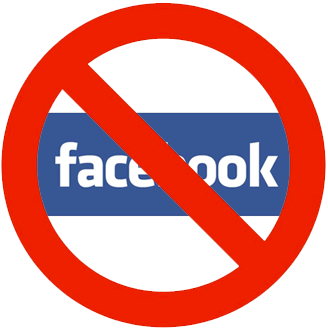 We did use facebook extensively up until late 2017 but we became unhappy about various aspects of how facebook has changed over the years. Facebook collects vast amounts of personal data which it then monetises, very few members of the public understand just how much information facebook have on them nor how that information is used. The facebook website is awash with advertising and pop-ups, something we don't allow on School Angel. ​There is clear evidence now relating to the use of facebook in the bullying of children and as a children's charity, until facebook are able to address this more seriously we would rather not use them. Twitter is far from perfect, but by the very nature of how it is structured it does not lend itself to some of the problems facebook has acquired. Many schools have also opted to use Twitter as a means of communication with parents. ​Please make sure you follow us on Twitter and we will keep you up to date with what is happening at the charity. Click on our twitter button below. This is your easiest and probably most important way to promote your charity page. With automated school email systems now fairly widespread, and over 80% of parents being on school databases this is a perfect way to connect. Another very important advantage for using your email system is that you can place a link from your email straight into the school angel site on your own school charity page. Because the email will be being read by the parents online, they can immediately visit the site, reinforcing your message. We have some template emails you can use to send out, or of course you can compose your own. The more frequently you remind people the better. Regular reminders especially at certain times of the year will be most effective, eg the most important time for booking the summer holiday is straight after Christmas, so why not set up your email system to send out to parents on boxing day reminding them to use the site for holiday bookings? Again many schools are now using sophisticated email systems like ParentMail and along with the automated email functions you can also opt to send out text messages to parents. This is another brilliant way to reinforce your message reminding your supporters to use your page. Why not consider sending a text message once a week (we would recommend either a Wednesday or Friday). We ask every school who joins the charity to insert a link from your school website into your school charity page. The position of the link from your site is up to you, but remember if it is hidden away on an obscure or rarely visited page no one will ever use it. 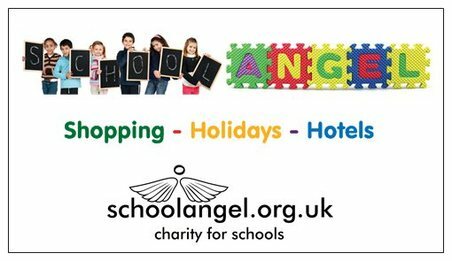 Why not consider placing a clear button from your homepage with the School Angel logo on it leading them straight onto your charity page - remember make it simple, straightforward and clear and you will be successful. Have a stall at your Christmas / Summer fete promoting the charity. Remind parents at prize giving events, assemblies etc. Dedicated shopping events are very effective fundraisers, some schools have held fashion nights where mums have bought summer clothes etc or summer holiday booking nights.Donations from fashion tend to be around 5% + and holiday bookings often raise £40 +. ​These events could be held at school or in someones home as a social event and the big advantage that everyone can be certain that they have made the relevant purchase using your school's fundraising page on the computer/device. It is not unusual to raise several hundred pounds during a single event using this method! Some schools raise significant funds by simply buying school supplies using their page. These tend to be office supplies but school trip travel arrangements are another significant fundraiser. Once you are registered with the charity we will send your school regular email reminders updating you on progress and importantly prompting you when, and how to effectively promote your school charity page. These may be reminders to book holidays over the Christmas period for example. We will devise template emails / letters which you can then customize to reflect the exact message you want to convey. We will never bombard you with emails though, just probably one per month. A QR code is a small printed box containing a series of usually black blocks in a seemingly random order, but which are actually a code that many smartphones are now able to read. The code can be set to open up any webpage. When your supporters visit your page from a mobile phone we deliver a special smartphone optimised version to make shopping extra easy. 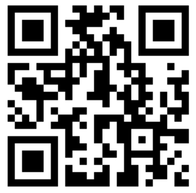 You don't need the QR code to access the page it just offers another route to finding it. If you would like a QR code to put onto school newsletters or posters then please email the charity and we will send you one back. When considering which logo format to use remember: Use jpeg if you want the logo to have a solid white background, and use png if you want your own website background to show through. When you add an image to a website you have the choice to add something called an 'ALT' attribute. This helps search engines understand what your image is of and what it is used for. On the logo image 'ALT' attribute enter the text 'school angel fundraising logo' (doing this makes it easier for your supporters to find your fundraising page). The following logo's are recommended for websites with light coloured backgrounds. The following logo is designed to use on websites with dark coloured backgrounds. 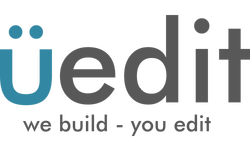 Uedit are the web design company who have provided our School Angel website for free, and they maintain it. They specialise in building high quality websites for small businesses and schools in the UK and have agreed to provide free help and advice to any school joining the charity on how to add in your website link if you need it.